Dynasties battle for the crown in Tessa Gratton's debut adult epic fantasy, The Queens of Innis Lear. Three Queens. One crown. All out war. I am the rightful heir of Innis Lear. No more will I wait in the shadows and watch my mother’s murderer bleed my island dry. The King’s hold on the crown must end—willingly or at the edge of my sword. To secure my place on the throne, I must produce an heir. Countless times I have fed the island’s forests my blood. Yet, my ambition is cursed. No matter what or whom I must destroy, I will wield the magic of Innis Lear. My sisters hide in the shadows like serpents, waiting to strike our ailing king. I must protect my father, even if it means marrying a stranger. We all have to make sacrifices. Love and freedom will be mine. TESSA GRATTON is the author of the Blood Journals duology, Gods of New Asgard series, and two books on writing fantasy for teen writers. She currently works for Serial Box Publishing as a lead writer on Tremontaine. She’s lived all over the world before returning to her prairie roots in Kansas with her wife. 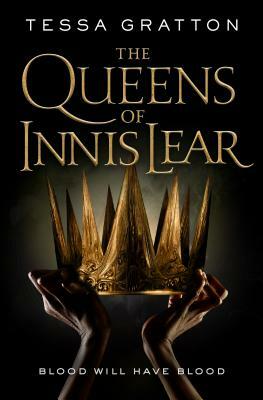 Queens of Innis Lear is her debut adult fantasy novel.